The title of this post is the same as that of an article in the February 2019 Edition of Modern Railways. A blend of heritage and commuter operations could be on the cards in Lancashire, if Rossendale Council’s plans proceed. The borough is the only one in Lancashire without a main line rail service. A report commissioned by the council in partnership with Lancashire County Council suggests co-operating with the heritage East Lancashire Railway, which runs from Heywood to Rawstenstall, to introduce such a rail link for the borough. Yesterday, I had a comment read out on the BBC, as I discussed in Wake Up To Money – New Stations. Wake Up To Money yesterday was broadcast from Darwen, which is only a valley away from Rossendale. One of the complaints on the program was about crowded roads and bad transport links to Manchester and Manchester Airport. It looks to me, that the proposed Rossendale services will fulfil a similar need. The main objective appears to be to create good links to Manchester and Manchester Airport, with a secondary objective of creating a link across the Pennines to Leeds with a change at Rochdale. The article gives more details of the proposal. 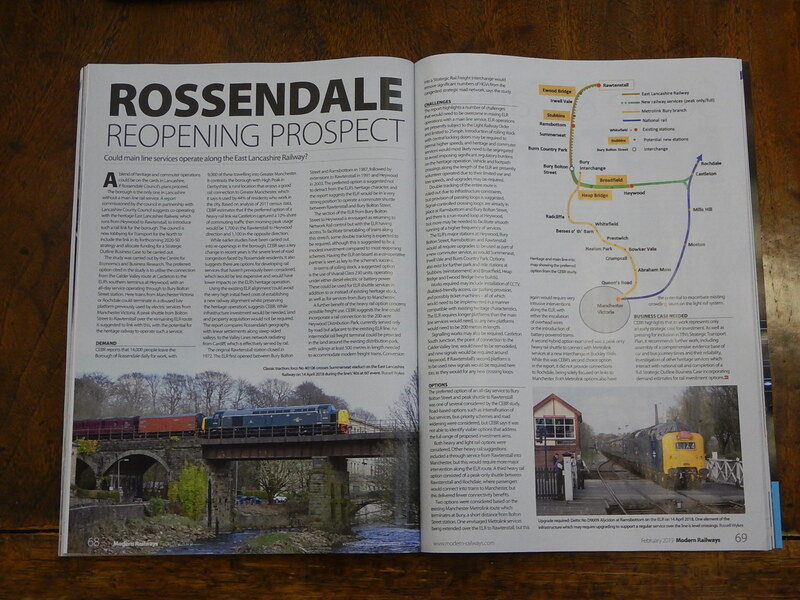 The plan envisages reinstating the route between Rawtenstall and Castleton Junction on the Calder Valley Line. The section between Rawtenstall and Heywood stations, via Bury Bolton Street station is the heritage line of the East Lancashire Railway (ELR). It is best described as predominately single-track with passing loops. The article says this about improving the track. The section of the ELR from Bury Bolton Street to Heywood is envisaged as returning to Network Rail control but with the ELR having access. To facilitate timetabling of trains along the stretch, some double-tracking is expected to be required, although this is suggested to be a modest investment compared to most reopening schemes. Having the ELR on board as a co-operative partner is seen as key to the scheme’s success. Having flown my virtual helicopter along the line, it looks to me, that it could become another scenic route out of Manchester. This Google Map shows Castleton Junction, where the East Lancashire Line meets the Calder Valley Line. The Calder Valley Line runs North-South. The ELR goes off to the West. Castleton station is in the North-East corner of the map. What was or is the large site to the North-West of the junction? The Junction will need to be upgraded and resignalled. It would be very unlikely, that the route will be electrified. Although, I suppose there is a chance, that the Calder Valley Line might be electrified, to create an electrified route between Leeds and Manchester Victoria. If this were to happen, then there would be electrification between Manchester Victoria and Rochdale. Castleton Junction, where the new route would join the Calder Valley Line would be electrified. This would make it easier and more likely for battery-electric trains to work the new route. Three routes are suggesting in the article. Bury Bolton Street and Rawtenstall – Peak-Hour shuttle. It is suggested that the third route would be run by the ELR. The article says this about rolling stock. In terms of rolling stock, a suggested option is the use of Vivarail Class 230 units, operating under either diesel-electric or battery power. These could be used for ELR shuttle services in addition to or instead of existing heritage stock, as well as for services from Bury to Manchester. The Class 230 trains are an obvious choice, but I think that other trains could also be suitable. I described a ride in a Class 230 train in Battery Class 230 Train Demonstration At Bo’ness And Kinneil Railway. The Class 230 train would have these characteristics. The three-car train has a useful capacity of around 300 passengers. The range on battery power should enable a service between Bury Bolton Road and Manchester Victoria stations. The batteries can be charged in under ten minutes. The operating speed is 60 mph. 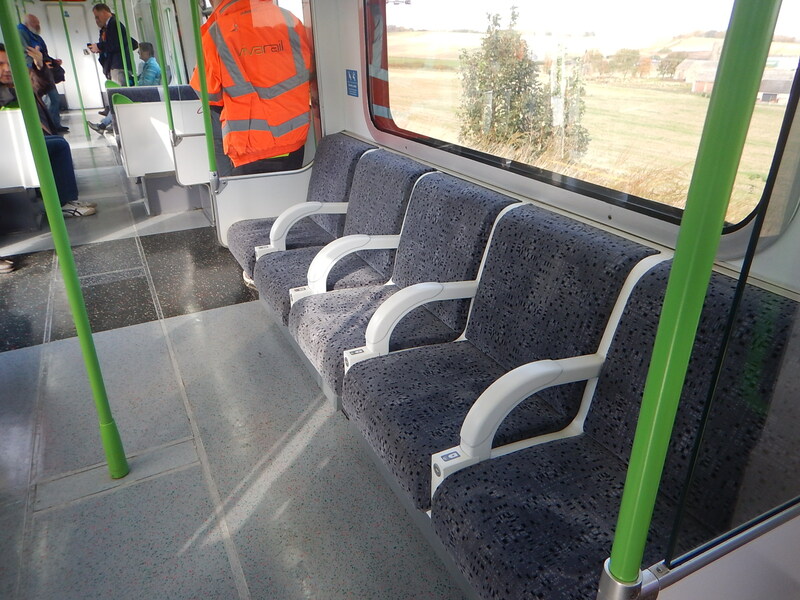 The trains have been designed to be easy to service and this can be done on a remote basis. The trains are of an age, to fit in well on a heritage railway. The trains also have the advantage of large windows for looking at the scenery. The trains would need to be charged at the end of the route and I suspect that Vivarail’s fast charging system would handle this in the terminal stations. Class 769 trains are electro-diesel trains, that use their diesel engines, where there is no 25 KVAC overhead electrification. They are four-car trains with a passenger capacity of over 300 passengers. They would have a very big advantage for the train operator. Services across Manchester are often paired to give travellers the chance to do cross-city journeys without changing trains. Using Class 769 trains would enable more services to be paired up. Class 399 tram-trains are under trial in Sheffield and they will also be used on the South Wales Metro. The terrain in Rossendale involves a hundred metre or so climb from Bury Bolton Street to Rawtenstall. Rochdale is perhaps fifty metres higher than Bury Bolton Street. Consider a Class 399 tram/train, working between Bury Bolton Street and Rawtenstall stsations. The altitude difference is 120 metres. This means that the train has a increase of potential energy of 25 kWh at Rawtenstall station. This would be easily stored in an appropriately-sized traction battery. It would appear that tram-trains should be able to climb to Rawtenstall, provided they could get to Bury with a full battery. I look at this in detail in Could A Class 399 Tram-Train With Batteries Go Between Manchester Victoria And Rochdale/Bury Bolton Street/Rawtenstall Stations? Alston Breeze trains could be a possibility, if hydrogen trains are compatible with steam trains. The trains would also be able to work across Manchester, as the Class 769 trains will be able to. Northern have lots of better quality diesel multiple units including Class 156 and Class 170 trains. The company also has around sixty new Class 195 diesel multiple units on order. These could obviously handle the route, but would it be better to use battery or more capable bi-mode trains on the route? I suspect too, that train companies, their staff, passengers and all Mancunians would like to see Central Manchester’s railways become a diesel-free zone. I obviously don’t have accurate figures, but I have a feeling that most of these trains could do a round trip in an hour between Manchester Victoria and Bury Bolton Street stations. The Class 230 trains would probably have time for a fast charge at each end of the route. It will be Class 230 or Class 769 trains. Both trains could work the services to Bury Bolton Street station from Manchester Victoria and Rochdale stations. The Class 769 has two advantages. It is the larger train. It could use its electric capability to cross Manchester. Both trains wouldn’t look out of place running a shuttle between Bury Bolton Street and Rawtenstall stations, as they are rebuilt trains from a previous era. A few points about the existing stations. Bury Bolton Street station has four platforms and will be the interchange between the new services and those of the ELR. The station has a bay platform that faces South East. With modern signalling, I would expect that it could handle four trains per hour (tph). Perhaps, these could be two tph from both Manchester Victoria and Rochdale stations. 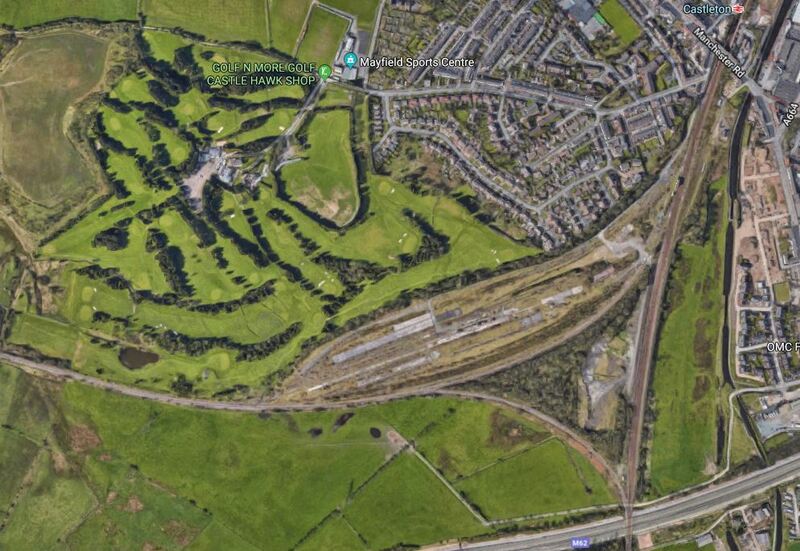 This Google Map shows Heywood station. At present it has a long single curved platform. I suspect to accommodate the new services, which could be four tph in both directions, the station would need a second platform. 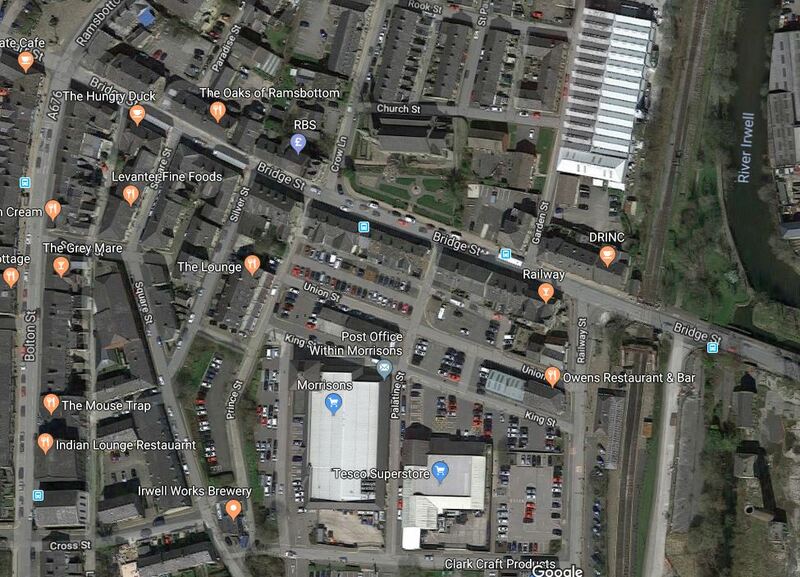 This Google Map shows Ramsbottom station. It is a two platform station, which appears to be close to the Town Centre and a Tesco Superstore and a Morrison’s. 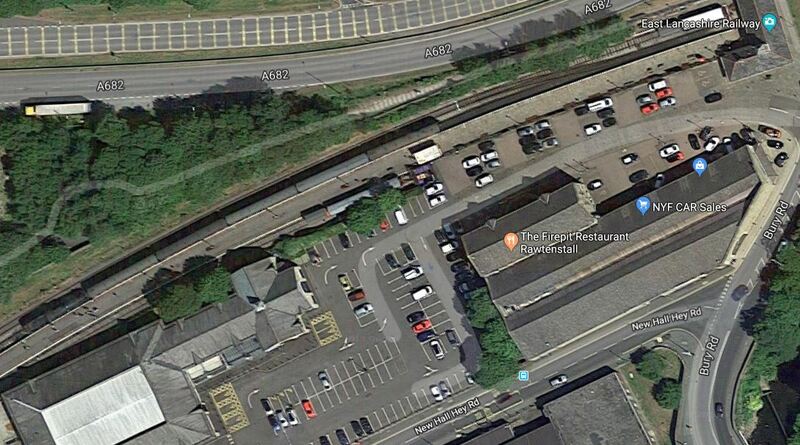 This Google Map shows Rawtenstall station. Note, the train in the single platform with a run round loop for a locomotive. The article says it would be possible to create a second platform at the station. It would appear that if Class 230 trains were to be used for the proposed.Peak Hour service to Rawtenstall station, then there would be space for installing a fast charger. Rochdale station will be a terminus for services from Bury Bolton Street station. This paragraph in the Wikipedia entry for Rochdale station describes the new bay platform at the station and how it is used. In 2015, construction on a fourth railway platform began. The 135m-long bay platform was completed in 2016 and is intended to relieve congestion at Manchester Victoria, where terminating trains would occupy the through platforms; numerous services now will continue on to Rochdale as opposed to terminating at Victoria. It is located at the south end of the main island platform, with the southbound through line having been re-aligned slightly further east to accommodate the new terminating line. This section of the Calder Valley Line appears to be very busy with a train every four minutes. I wonder, if by diverting some services to Bury Bolton Street station, this helps ease traffic on the Calder Valley Line. Could trains do the following triangular route? Train timetablers with much more knowledge than myself, will have fun getting a workable timetable. About half-a-dozen new stations will need to be built. Most will probably be fairly simple affairs and those North of Bury Bolton Street station could probably by just a single platform. There is one possibly proposed station, that could be more complicated. Buckley Wells station could be built where the Bury Line of the Manchester Metrolink and the East Lancashire Line cross by the A56. Park-and-Ride stations are also suggested in the article at Broadfield, Ewood Bridge, Heap Bridge and Stubbins. The article also raises the possibility of running freight trains between the Calder Valley Line and Heywood. ,The line could incorporate a rail connection to the 200-acre Heywood Distribution Park, currently served only by road, but adjacent to the existing ELR line. An intermodal rail freight terminal could be provided in the land around the existing distribution park, with sidings at least 500 metres in length needed to accommodate modern freight trains. Conversion into a Strategic Freight Interchange would remove significant numbers of HGVs from the congested strategic road network. Would the implementation of this plan for freight be popular with the residents of Rossendale? The proposal is a comprehensive one, which could benefit several groups. The proposal needs further investigation to see whether there is a strong business case for implementation. I also think, that this sort of project model, where a heritage line is integrated with the National Rail network, can be repeated elsewhere in the country. We have some very well-managed heritage railways in the UK, some of which could be extended to the National Rail network to provide much needed passenger and freight services to new and existing developments and difficult to access towns. The rules need to be developed, so that these projects can be developed. Maps 2 and 3 in GM Transport Strategy 2040 would tend to indicate that Tram-train under consideration for Rochdale to Heywood/Bury. I can’t imagine ELR wanting overhead line up t’valley though. Class 230 would presumably be far cheaper option. The tram-trains for the South Wales Metro are Class 399 tram-trains as in Sheffield, but with an added battery capability. I don’t know the ELR, although I intend to visit soon. How steep is the line to Rawtenstall? Remember that Trains for Wales will be using 230s on the Conwy Valley Line, which is not for wimps! I have spoken to Adrian Shooter and his team and they have impressed me with their zest for innovation. I have also ridden in a Class 230 and the Class 379 IPEMU. Battery trains have a certain je ne sais quoi! It could be that they are very simple and there are a lot less moving parts. Their charger looks particularly efficient and I think, they’ll get battery 230s to do things that many would feel impossible. So I think, that they will often be the more affordable option.